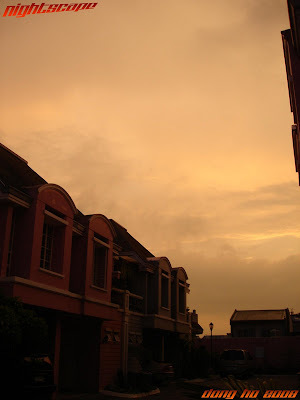 looking at yesterday's blurry sky at dusk led me to think of myanmar's tragic experience of cyclone Nargis. thousands died and thousands are still missing. the tragedy doesn't end there as the survivors struggles from food shortage and even battles for malaria and diarrhea outbreaks. here in the Philippines, we experience super typhoons but not as worst as this. death toll is still rising. let's hope that there will be more survivors from the missing list. Let's hope all the necessary resources get to Myanmar and the suffering is minimal. I heard about the piteous tragedy and my heart goes out to all the residents of Myanmar. I heard most of the casualties are children.. Yes, I too pray for the gentle people of Myanmar and that they may get help and soon. hi sandy, amen to that. hi arlene, yes. children were very much affected by this. let's hope that they'll recover soon. hi cristina, no problem. keep in touch. kurisujae, thanks to that. let's always pray for their safety and survival for others. hi laura, i hear that on the news. i also wonder why their government does not make an immediate resolution to that when their people are already suffering and dying. i hope that it will be resolved immediately. thanks dina. they really need that. hi bid yan, nice to hear from you. salamat sa pag-appreciate sa dusk shot. thanks din sa dasal para sa myanmar. It is terrible about all of the losses and I hope more of the missing will be found. it has reached the 100,000 death toll...looks like they're having problems with the relief goods and foreign aids coming in. carver, we are hoping for the same thing. but the latest news is that the myanmar government already allowed assistance from other countries. this will give more chance of survival. ely, just today, there's a news that they already allowed foreign assistance. thank God. It is so hard to imagine the devastation. Natural disasters are so tragic and there's nobody to blame for it. dra. rio, salamat. they really need our prayers. hi karen, yes. this is out of human control. i hope myanmar recovers soon. bw, that's sad but the latest news tells that they already started accepting assistance from other countries.